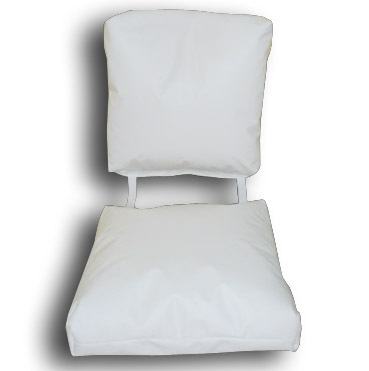 Great for lumbar support for leaning posts or wherever portable, waterproof seating is needed. Very similiar to the folding stadium cushions of years past but designed for the boat. A very inexpensive solution when there just isnt enough space for an E-SeaRider. Each pad measures 20" x 20" x 5" and there are 2 pads total. One can be used as a seat the other as lumbar support or they can be doubled up. Both are adjustable both in fill level and relation to the other pad. The pads have a buckle so that they may be seperated or laced inbetween other cushions.